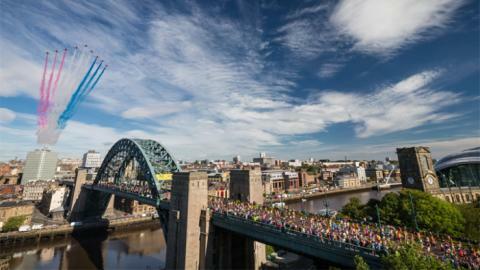 We’re looking forward to welcoming the world to the North East for the world’s great half marathon, the Great North Run. We’ve got special bus services for spectators and competitors available on the day of the Great North Run, which takes place on Sunday 11 September. Whether you’re travelling to see the start, the finish or even both, there’ll be a Go North East bus to help you on your way, plus we’ve got buses to get the runners from one end to the other too. If you’re making a weekend of it, we’ve also got buses which link the Rail and Metro stations with most of the major hotels on both Newcastle and Gateshead Quaysides, plus we can get you to Whitley Bay, South Shields, Sunderland and Durham too. Q1 & Q2 link Newcastle’s Central Station (National Rail & Metro services) with Gateshead Quayside for hotels such as the Hilton, Jurys Inn & Ramada Encore. Buses on Q3 link Newcastle City Centre (with connections from Metro services) with Newcastle Quayside for hotels such as the Vermont, Premier Inn, Travelodge, Malmaison & Hotel du Vin. If you’re staying close to Metrocentre, we’ve got frequent buses into the City Centre, with our TEN stopping close to the Premier Inn & Travelodge Hotels and our Northern 6 or 45/46 Red Kite routes stopping outside the Marriott Hotel. You can buy a Great North Run weekend M-Ticket which gives you unlimited access to all Go North East bus services, including our special Great North Run buses on race day. Tickets are priced at £11 and are available by clicking here. Save the hassle of parking in the City Centre and catch the bus to Newcastle or Gateshead for the Junior & Mini Great North Run. Enjoy the fun on Newcastle Quayside, with our Q3 (stopping close by or catch our Q1/Q2 to the Sage in Gateshead. Travel all day on any Go North East bus with our Family Day Ticket and up to 5 people can travel for only £12.50 – buy from the Go North East app or from your bus driver. Before the start of the race, our R1 buses will run at least every ten minutes between 06.15 and 10.30 from Bents Park Road (next to the finish area) & Frenchman’s Bay in South Shields to Barras Bridge in Newcastle which is only a short walk to the start line on the Central Motorway. Bents Park Road is close to a number of the seafront car parks and within easy walking distance of the car parks in South Shields town centre. Our R3 service will be running every 10 minutes from Stand F at Heworth Interchange to Barras Bridge in Newcastle from 8.30am until 10am and we’ll have staff on hand to help you. We’ve got lots of routes from across the region to get you into Newcastle City Centre on the morning of the race with buses arriving on New Bridge Street, St Mary's Place or Eldon Square Bus Station. Spectators can catch our R1 service from Barras Bridge in Newcastle to the finish at South Shields. Buses run every few minutes between 7am and 12 noon. This year, we’ll have fast buses to get spectators from Heworth to South Shields Town Centre. Our X27 will run every 10 minutes from Heworth (Maiden Over) to South Shields between 11.30am and 1pm with buses stopping at Hebburn Victoria Road and Jarrow Bus Station. We’ll have staff on hand at Heworth to help you along the way. From Gateshead or Heworth Interchanges, you can catch the Crusader 27 service which runs every 20 minutes to South Shields town centre. Catch our R1 service which runs every few minutes from Bents Park Road (close to the finish line) to Newcastle City Centre, non-stop between 12.30pm and 5pm. You can also catch our X27 which leaves from Keppel Street in South Shields Town Centre and calls at Jarrow Bus Station, Hebburn Victoria Road, Heworth Interchange, Gateshead Interchange and Newcastle City Centre. Buses will run every few minutes between 1pm and 5pm. Our Crusader 27 service will run every 20 minutes from South Shields Keppel Street via all stops to Jarrow, Hebburn, Heworth, Gateshead and Newcastle. We’ll have staff to help you on Bents Park Road and in South Shields Town Centre too. We’ve got the buses to make your Great North Run weekend run smoothly and we’ve got great value tickets too. Download the Go North East app and you can then buy any of the Great North Run tickets listed below. The day and weekend options cover all of our bus services across the region. Family Day Ticket - £10 on the app, £12.50 on the bus. Covers up 2 adults and 3 under 16s. Go North East Buzzfare & Network One Day Rover tickets can be used on the R1 or X27 services, but please note that Concessionary passes can’t be used on the R1 or X27 services. There will be a number of diversions in place on the day of the Great North Run (11 September). A small number of services will also be on diversion in the week prior to the run - from 5 until 10 September.